Consumer Behaviour in Sport and Events emphasises the role of consumer behaviour in sport marketing. Given the social, economic, and environmental benefits of sport events, the challenge for marketers is to understand the complexity of sport and event participation. Through a heightened understanding of consumer behaviour, marketers are able to develop communication strategies to enhance the experience, while identifying key elements of the consumer’s decision-making process. This book provides students and industry professionals with the knowledge and skills necessary to meet the current marketing challenges facing professionals working in the sport and event industries. A comprehensive events checklist to help understand marketing actions related to the development, promotion and delivery of a sport event. 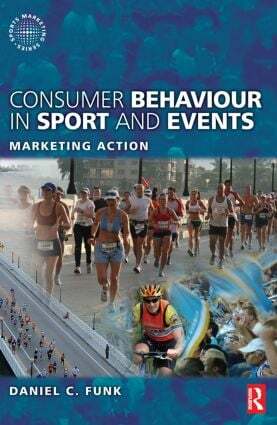 Sport and event consumer behaviour is a rapidly growing area of interest and this book is considered a valuable resource for those involved in the sport and events industries from students to marketers to academics. Dr Funk has unique knowledge and skills in the areas of sport, events and tourism. He combines a strong background in Sport Marketing and Sport Consumer Behaviour with 7 years industry experience in running sporting events. Dr Funk has taught in various countries and brings an international flavour to the project.